According to THE BBC News subtitles. One of the funniest things about today's wedding. I'm sure Jack won't disagree. Hope he has fun playing with them tonight. Don't think it was a mistake by BBC. Someone had to pluralize the subtitle to go from 'dress' to 'breasts'. That suggests a conscious effort. Perhaps a raw joke? Maybe it was deliberate, another minor royal Lady Helen Windsor used to have the nickname 'Melons'. Indeed, Eugenie's own mother was known as the Duchess of Pork. Original Quill wrote: Indeed, Eugenie's own mother was known as the Duchess of Pork. I know, she has spoken out about how hurt she was by that. Odd how the royal women (well women in general really) are judged on their looks so harshly. A man can be pig ugly and it's mostly overlooked by the media. Not quite so. 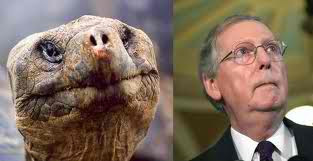 Have you noticed how US Senate Leader, Mitch McConnell, is often described ole' turtle-mouth? Well, I can see a resemblance.